MetLife Building, Head Office of MetLife in Motijheel, Dhaka. 6th BSHRM-MetLife International HR Conference-2017 will be held on 3rd March 2017 at BICC, Dhaka. Aiming to that conference an MoU has been signed between Bangladesh Society for Human Resources Management (BSHRM) & MetLife on 04th January, 2017 (Wednesday) at the MetLife Building, Head Office of MetLife in Motijheel, Dhaka. Mr. Akhlaqur Rahman, Chief Operations Officer (COO) of MetLife Bangladesh and Mr.S.M. 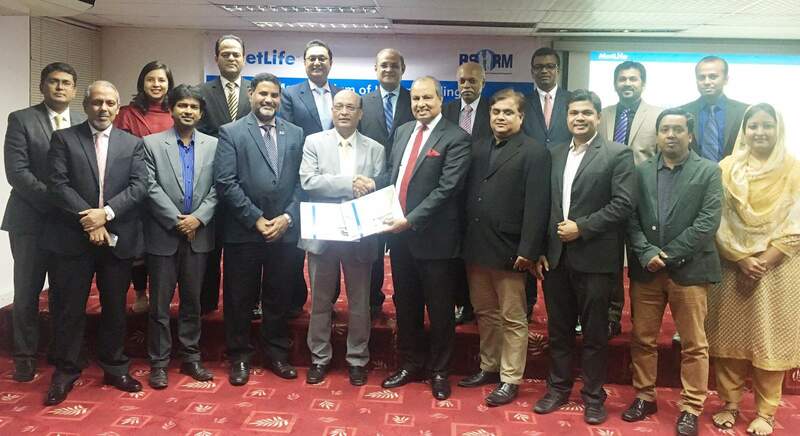 Zahir Uddin Haider FCMA, Conference Chair & Fellow of BSHRM signed on behalf of their respective organizations. After the signing, Md. Musharrof Hossain, President & Life Fellow of BSHRM and Md. Nurul Islam, Regional Senior Vice President, Head of Bangladesh, Nepal & Myanmar of MetLife handed over the documents between them. Senior leaders from both organizations were present in the signing ceremony. All interested people are requested to contact for registration through e-mail: conference@bshrmbd.org or info@bshrmbd.org, Cell: 01790444477 or 01790444411, www.bshrmbd.org.